The steel bridge system, referred to as “Simple for Dead Load and Continuous for Live Load (SDCL)” has gained popularity in non-seismic areas of the country. Research conducted over the past 10 years has resulted in development of complete design and detailing provisions for this new system for non-seismic applications. Results of this work are summarized in five journal papers. In the SDCL bridge system there are no bolts or expansion joints in this system, resulting in higher service life, in addition to many other advantages. The system is well suited for accelerating the construction process. It is ideal for building individual spans off site, transporting them to the final location and then joining the spans over the middle piers to create continuity for live load. Another version of the system which utilizes adjacent beam technology can significantly reduce the onsite construction activities. The main objective of the proposed project is design and verification testing of a component level specimen using a SDCL for seismic connection. During Phase I of the project, suitable details were developed using numerical analysis. The next step is performing component level testing on the connection details prior to a large scale shake table test. The goal of the component test is to proof load the connection between the substructure and superstructure. If designed properly, the failure should not occur within the connection itself. The objective of the proposed project is the design and testing of the component level specimen. This testing is being performed as a verification test prior to shake table testing. The goal of the component test is to proof load the connection between the substructure and superstructure. The research approach in this phase of the project will consist of primarily small scale component testing to evaluate the performance of various details of the connection. 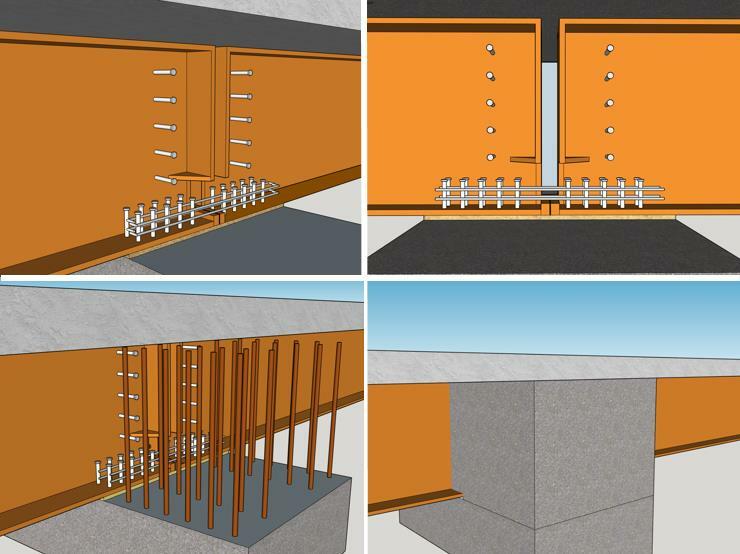 The first task will be to design a connection detail. This work was primarily done during Phase I of the project and a recommended detail is shown below. Component testing will then be performed on the proposed connection detail. The specimen will be inverted for testing, with the deck facing downward and the column upward, as shown in the figure below. Based on the outcome of the component testing, additional revisions to the detail may be required prior to conducting the shake table test. The results of the component test will be reviewed and compared with expected behavior. Deviations from the expected behavior will be explored through numerical or analytical studies as needed.